Successful development of players of all ages, both on and off the ice through the commitment of accountability and work ethic inside a positive hockey culture. The Carolina Rage was formed in 2016 with the intention to help develop and grow the game of hockey in the southeast. The Carolina Rage is a hockey program that prides itself on instilling work ethic, discipline & commitment while delivering world class hockey training in a great environment. 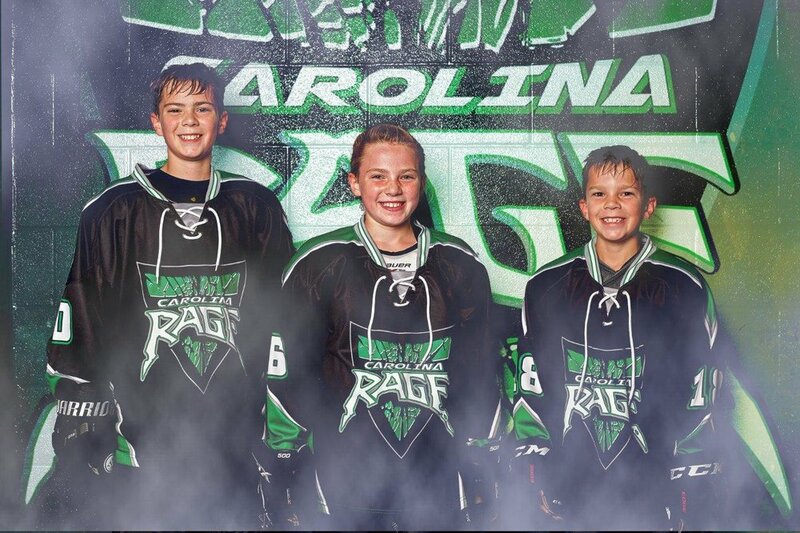 The Carolina Rage focuses on building a great hockey culture that produces the environment for lasting development and memorable experiences for both athlete and family. The Carolina Rage is committed to forward thinking through building hockey relationships locally & nationally. The Carolina Rage’s core practice and game schedule is predominantly on the weekends. Longer practices on weekends allow the weekdays to be less hectic so kids/parents enjoy their week instead of trying to survive it. To really gain maximum development a player not only needs to be doing the right things on the ice, but he/she needs to be doing it as much as possible weekly. The Rage practices on & off ice fully developing a player’s skills and talent, averaging over four hours a weekend on the ice and three hours weekly. Families can now look forward to hockey weekends. By utilizing the weekend developmental model, we are a unique organization. The weekend model allows for less weekday travel and school/homework disruption. It also accommodates families with kids at different age groups to practice and travel together. It allows us to have the kids on the ice for several hours in a weekend and really focus on fundamentals. Darren grew up in playing minor & high school hockey in North Bay, Ontario. He played Junior in Sudbury and Niagara Falls and went on to a very successful collegiate career at Iowa State University, and would later be inducted into the hall of fame. Darren is one of the Rages' founders and has proven to be a great ambassador for the Rage by building relationships within the hockey world. He continues to lead the Carolina Rage's development both on and off the ice. His vision of relevant hockey development with matching culture, continues to shine as the Rage excels nationally. Brad grew up in Pittsburgh PA where he played his minor hockey. He went on to play Junior in Wisconsin for the Bozeman Ice Dogs. Brad played professionally in the WCHL, WPHL & UHL. Before coming to the Rage, Brad was employed by the Penguins Elite program and also coached several Penguins Elite teams to very successful seasons. He has since focused on skills and skating techniques that have him training many elite players along with some NHL players. Some of them include: JT Miller, Vincent Trocheck & Kris Kunitz. Paul grew up in Winnipeg, Canada, where he played AAA hockey until he moved away from home at 16 to play in the Western Hockey League for the Brandon Wheat Kings. Paul’s junior teams also included the Spokane Chiefs, Saskatoon Blades and Nipawin Hawks. During his junior career, he was also one of fifty players invited to the Canadian National Team tryouts in 1996 and again in 1997. After his junior career ended, his professional career spanned four years in the ECHL with a brief stint in the AHL with the Portland Pirates. Paul was also a very active inline hockey player in the off season. He won a bronze medal while playing for Team Canada in the 1998 World Inline Hockey Championships.